ETHAN FROMEI had the story, bit by bit, from various people, and, as generallyhappens in such cases, each time it was a different story.If you know Starkfield, Massachusetts, you know the post-office. If youknow the post-office you must have seen Ethan Frome drive up to it, dropthe reins on his hollow-backed bay and drag himself across the brickpavement to the white colonnade; and you must have asked who he was.It was there that, several years ago, I saw him for the first time; andthe sight pulled me up sharp. Even then he was the most striking figurein Starkfield, though he was but the ruin of a man. It was not so muchhis great height that marked him, for the "natives" were easily singledout by their lank longitude from the stockier foreign breed: it was thecareless powerful look he had, in spite of a lameness checking each steplike the jerk of a chain. There was something bleak and unapproachablein his face, and he was so stiffened and grizzled that I took him for anold man and was surprised to hear that he was not more than fifty-two.I had this from Harmon Gow, who had driven the stage from Bettsbridgeto Starkfield in pre-trolley days and knew the chronicle of all thefamilies on his line. "He's looked that way ever since he had his smash-up; and that'stwenty-four years ago come next February," Harmon threw out betweenreminiscent pauses.The "smash-up" it was--I gathered from the same informant--which, besidesdrawing the red gash across Ethan Frome's forehead, had so shortened andwarped his right side that it cost him a visible effort to take the fewsteps from his buggy to the post-office window. He used to drive infrom his farm every day at about noon, and as that was my own hour forfetching my mail I often passed him in the porch or stood beside himwhile we waited on the motions of the distributing hand behind thegrating. I noticed that, though he came so punctually, he seldomreceived anything but a copy of the Bettsbridge Eagle, which he putwithout a glance into his sagging pocket. At intervals, however, thepost-master would hand him an envelope addressed to Mrs. Zenobia--or Mrs.Zeena--Frome, and usually bearing conspicuously in the upper left-handcorner the address of some manufacturer of patent medicine and the nameof his specific. These documents my neighbour would also pocket withouta glance, as if too much used to them to wonder at their number andvariety, and would then turn away with a silent nod to the post-master.Every one in Starkfield knew him and gave him a greeting tempered tohis own grave mien; but his taciturnity was respected and it was only onrare occasions that one of the older men of the place detained him fora word. When this happened he would listen quietly, his blue eyes on thespeaker's face, and answer in so low a tone that his words never reachedme; then he would climb stiffly into his buggy, gather up the reins inhis left hand and drive slowly away in the direction of his farm. "It was a pretty bad smash-up?" I questioned Harmon, looking afterFrome's retreating figure, and thinking how gallantly his lean brownhead, with its shock of light hair, must have sat on his strongshoulders before they were bent out of shape. "Wust kind," my informant assented. "More'n enough to kill most men. Butthe Fromes are tough. Ethan'll likely touch a hundred. ""Good God " I exclaimed. 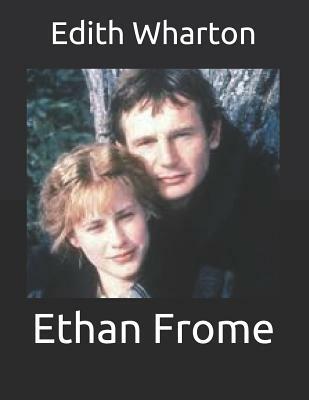 At the moment Ethan Frome, after climbing tohis seat, had leaned over to assure himself of the security of a woodenbox--also with a druggist's label on it--which he had placed in the backof the buggy, and I saw his face as it probably looked when he thoughthimself alone. "That man touch a hundred? He looks as if he was dead andin hell now "Harmon drew a slab of tobacco from his pocket, cut off a wedge andpressed it into the leather pouch of his cheek. "Guess he's been in.